I lost my compact digital camera, a Minolta, while down in Miami for James's bachelor party. I've begun searching for a replacement because a compact digital camera that fits in your pocket is just too precious to live without in this day and age. My main pet peeve with digital cameras is lag time. 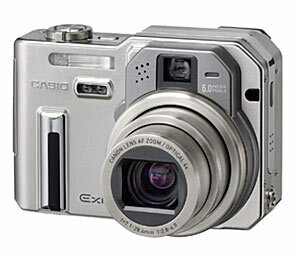 Digital cameras can be slow to turn on, slow to focus, slow to snap. Not endearing when what you're seeking to capture is often a fleeting moment in time. Fairly compact, the specs that caught my eye were the 1.5 second startup time and .01 second shutter release time. Throw in the ability to snap 3 frames per second in burst mode, decent battery life, 4X optical zoom, exposure bracketing, and up to 6 megapixels in resolution, and I'm out looking for the engagement ring.